The satellite trucks are parked, the signs have gone up and the pundits have placed their bets. Everyone seems to think they know what Apple has in store at its event on Wednesday: Namely, a higher-resolution iPad and, perhaps, a revamped Apple TV. But it’s Apple, so you can never be too sure that there won’t be a surprise. Whatever the company has to say, AllThingsD will be on hand to give live coverage and analysis. Check back here, starting just ahead of the event at 10 am PT. 9:35 am: We are being let in now. 9:54 am: Okay, took us a bit to get set up, but we are online and with a backup system in place, as well. 9:57 am: Tim Cook has taken the stage and offered up his “good morning,” to applause. He promises he has a great morning planned. “I want to get started by talking about the post-PC revolution. … It is happening all around us, and at an amazing pace.” And, of course, he says Apple is leading. 9:59 am: Such devices have to be way easier than any PC has ever been. We have three blockbuster post-PC devices, Cook says: The iPod, the iPhone and the iPad. “Any company would be thrilled to have just one of these devices,” he said. Apple has all three. It sold 172 million post-PC devices, accounting for 76 percent of the company’s revenue, he said. “Apple has its feet firmly planted in the post-PC future,” he said. 10:02 am: Stores are important because these devices are new to many people, Cook said, showing pictures of the company’s newest store, in Amsterdam, which marked its 362nd outlet. Some 110 million people visited a retail store last quarter, Cook said. 10:04 am: Cue video of Apple’s new Grand Central Terminal store. 10:04 am: Another key element of our post-PC success is iOS, Cook says, showing an iPhone, iPod touch and iPad, with 315 million such devices sold through last year, including 62 million last quarter alone. Now he’s talking about Siri and playing some clips of Siri from other parts of the world, such as Australia and France. In France, by the way, Siri is a guy. Today we are bringing Siri to Japan, Cook announces. 10:07 am: Siri in Japan is part of iOS 5.1, an update being made available today. There are now 585,000 apps in the app store, which Apple announced on Monday has crossed 25 billion downloads (free and paid). 10:09 am: Talk has shifted to iCloud, which will now support movies in addition to music and TV shows. You can re-download movies you have purchased, and movies and TV shows will now be available in 1080p. 10:11 am: Eddy Cue comes out to demo the new Apple TV. 10:12 am: Tweaked interface. Also easier to get to third-party content, Cue said. Photo Stream also shows up automatically on new Apple TV, and in 1080p. 10:15 am: New Apple TV remains $99 and goes on sale next week, though you can order now. 10:16 am: The set-up for the new iPad is classic Apple — momentum stats, glowing reviews, etc. 10:17 am: Goal of the iPad was to be the best device for some of the tasks people do every day, such as Web browsing and checking email. “This is a tall order,” he said. But, he said, Apple’s research seems to bear this out. Many iPad owners who have a PC and smartphone said iPad was their favorite Web browsing and email device. The iPad also won out over e-readers for book reading, and against game consoles and handheld game players for gaming, Cook said. 10:19 am: Cook notes that more than 100 tablets came to market last year, but they don’t offer the experience of the iPad. He shows Twitter running on a Samsung tablet, saying it is more like a blown-up phone application experience, while on the iPad it is a totally different experience. Same thing with Yelp, he said. “This is a key reason why momentum on iPad continues to build and the competitive tablets aren’t gaining traction,” Cook said. Everyone keeps wondering who will come out with a product better than iPad 2. 10:22 am: Marketing chief Phil Schiller on stage to show off the new iPad. 10:23 am: First new feature is the Retina display, as expected. “Until you see it, you can’t understand how amazing this is,” Schiller said. 10:23 am: The giant wall display behind him, Schiller said, actually has fewer pixels than the new iPad. The new iPad has 31 million pixels, with resolution of 2048 by 1536 pixels. That’s one million more pixels than an HD TV, Schiller said, and 264 pixels per inch. “That is enough to call it a Retina display,” Schiller said. The iPhone has it when held at 10 inches from the face. The same is true of the new iPad, when held at 15 inches away or even somewhat closer. 10:27 am: The new iPad is powered by an A5X chip, with quad-core graphics needed for new high-resolution display. Apple says the older A5 chip had twice as much graphics power as Nvidia’s Tegra 3, while new A5X has four times the graphics power — again, according to Apple. “This is the best mobile display that has ever shipped,” he said. 10:28 am: New iPad has 5 megapixel camera with technology brought over from the iPhone 4S. Schiller shows off some of the photos taken with the new iPad. 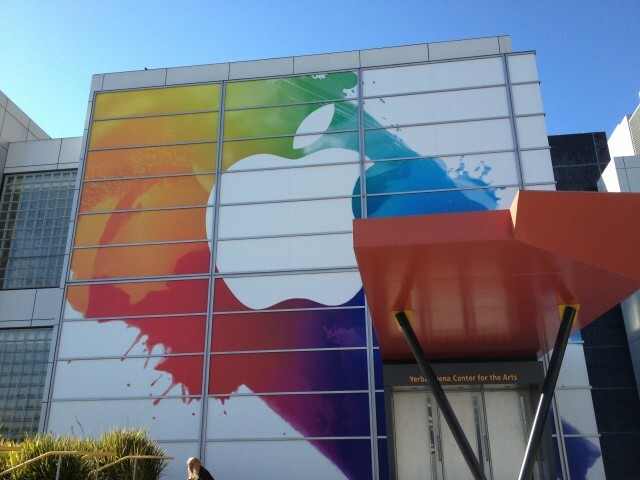 10:29 am: For more on the new iPad, check out this post from colleague Peter Kafka. 10:30 am: The iPad now has 1080p video recording, Schiller said. 10:31 am: The new camera also has image stabilization, Schiller said, showing a demo of that. 10:31 am: The new iPad also has voice dictation, thanks to a microphone button on the iPad’s virtual keyboard. It supports U.S., British, and Australian English, along with French, German and Japanese. 10:33 am: New iPad will also support next-generation 4G LTE networks, such as the ones from Verizon and AT&T. It will also support two other faster network technologies — HSPA+ and dual-channel HSDPA. That’s important, because LTE is rolling out slower globally than it is here in the U.S.
10:35 am: And we’re getting a demo of the real-world difference such high-speed networks can make when doing things like playing streaming video. 10:36 am: Working with AT&T and Verizon in the U.S., and Rogers, Telus and Bell in Canada on LTE, with other high-speed network support elsewhere in the world. 10:36 am: In the U.S., there will be two versions of iPad with LTE — one for AT&T’s LTE network, and the other for Verizon’s LTE network, because the two use different bands. It also can act as a hotspot, and can roam onto 3G networks worldwide. 10:37 am: Schiller in sales mode, recapping key new features. He notes that a lot of these things sound like they would eat up a lot of batteries. The iPad 2 boasted 10 hours for regular use and nine hours for 3G data use. And the new iPad has the same battery life. 10:39 am: It’s 9.4 millimeters thick and 1.4 pounds. The new iPad will start, as the iPad 2 did, at $499 for 16 gigabytes, with $100 more for 32GB, and $200 more for 64GB. 4G wireless models cost an extra $130. This is all the same as with iPad 2. New iPad available March 16, with preorders starting today. 10:41 am: Schiller is talking about how software looks on the new display. Some stuff happens automatically, such as text size. But if developers do some work on their own, they can more fully take advantage of the new chip and display. 10:42 am: Schiller said they asked a few companies to try out the technology for a week and see what they could do. First demo is from Namco, a game designer known for Pac-Man and other titles. They show a glimpse of a new flight-simulation game. The new iPad helps make the game more immersive, the company said, making it easier to lose yourself in the game with things like heat haze coming off of the plane’s engine. Nice fly-by of the Golden Gate Bridge, too. Game is Sky Gamblers: Air Supremacy, Namco said, which comes out later this month. 10:45 am: Next app demo is from Autocad creator Autodesk. The company already has a line of programs, including SketchBook, for iOS. Program being demoed is a new title, SketchBook Ink, a drawing app for line art. 10:47 am: Meanwhile, here are some of the things we are waiting to hear about: What will the data plan pricing be for new iPads? Will Sprint have an iPad to sell? SketchBook Ink will be available in April, Autodesk said. 10:49 am: Third and final app demo from Epic Games, with president Mike Capps onstage. It’s the latest version of the Infinity Blade saga: Dungeons. The gamers in the crowd seem happy. 10:54 am: Apple’s productivity software, iWork, is being updated for the new iPad. So is iLife, with GarageBand players now able to jam with one another. 10:56 am: The iWork apps are available today in the App Store, for $9.99 apiece for new buyers. GarageBand remains $4.99 for new buyers, and both are free updates for those who have already bought them. 10:57 am: The iMovie app for iPad is also getting an update, including some new features, such as creating a faux movie trailer (or a real one, I suppose). 11:00 am: Apple is also bringing the third iLife app, iPhoto, to iPad. The iPhoto app joins the camera and photo library apps, Schiller said, for those who want to do more with their photos. Among features are multitouch editing, professional quality effects, brushes, etc. Photos can be beamed among iOS devices. New way to share photos with friends — photo journals using iCloud. 11:03 am: Colleague Peter Kafka notes that while iTunes will now support re-downloading purchased movies, not all studios are behind the feature, so it will work with some flicks, but not others. 11:06 am: Apple demoing how multitouch can make photo editing more intuitive, such as changing the shadow or saturation in one part of a photo. 11:08 am: There are finger-powered brushes for doing all kinds of things, such as lightening a dark face in an otherwise well-exposed photo. All the editing tools are nondestructive, meaning you can go back to the original. There are a bunch of different effects, too, from different monochrome options to artsy and vintage ones. Photo Journal creates a layout of photos, with those favorited or with a caption made larger. It looks a bit like how Facebook’s Timeline handles photos from an album. You can throw in a map of the location, a date based on when photo was taken, even a weather icon that will use historical weather data to show what the temperature was like. The resulting “journal” can then be stored on iCloud and shared as a Web link. The new iPhoto works on both iPhone and iPad. It will be $4.99 on App Store, starting today, Schiller said. 11:14 am: And, cue video for new iPad. 11:14 am: So far, it’s just being called “the new iPad,” not iPad 3, iPad HD, or other names thrown about in recent days. New iPad with higher-res display, A5X processor, LTE support, improved 5 megapixel camera and 1080p recording. Same models and prices as iPad 2 was priced at. Separate LTE versions for AT&T and Verizon. Apple TV with support for 1080p at $99. And iPhoto for iOS, $4.99, starting today. Other iLife and iWork apps updated. Apple also keeping iPad 2 in the lineup, starting at $399 for 16GB model, a $100 price chop. 11:21 am: Consensus seems to have nailed things pretty well, so far. Cook now showing Apple’s TV ad for new iPad. 11:22 am: Cook, as Jobs did before him, wraps up by thanking Apple staff. Cook ends with a tantalizing tease. “Across the year, you are going to see a lot more of this kind of innovation. We are just getting started,” he said. 11:23 am: And he exits, stage right.